You Matter — Make sure you remember that! This post is a deliberate departure from our usual kind of post. Educators, to be good educators, need to think about their own welfare. As autumn dazzles us with its golden and red hues, take time to realise that YOU Matter. Your health and well-being matters. It is time to slow down, take time, and take stock. What are you doing to take the best possible care of yourself? To value yourself? To fortify yourself for the coming winter season? 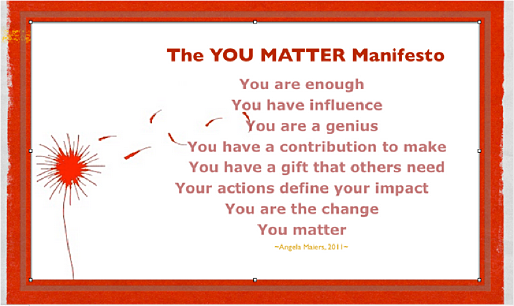 In 2012, I stumbled upon Angela Maier’s The YOU MATTER Manifesto. 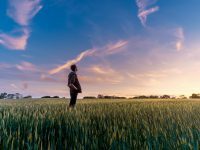 Having been a fan of the Holstee Manifesto for a long time, it got me thinking: how often do we tell ourselves that we matter? We are often very well rehearsed with valuing others, seeing strength and MAGIC in others. Why do we find it so hard to value, see strength and MAGIC in ourselves. 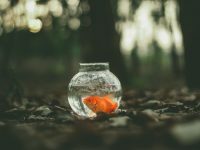 On October 6 last year, Fionna Wright blogged Quite Simply Included… This post really challenged me to be conscious and alert around every word and action, as each and every word or act seeks to include or exclude. As we turn this inwardly and point the finger at our self, what do we say to our self that is kind? Necessary? Nice? Are we better at building our self up or knocking our self down? Do we even know how to treat our self as we would a very good friend? We probably all know the saying, “You can’t pour from an empty cup; take care of yourself first”. Maybe you can schedule a precious 17 minutes and 24 seconds to “practice emotional hygiene — taking care of our emotions, our minds, with the same diligence we take care of our bodies.” Guy Winch: Why we all need to practice emotional first aid. Some ideas you might explore? Connect — Find your pack! Connect with others who fill your cup! Take time to seek out and hang out with like-minded individuals. Hang out with people who share your experiences. Whether it is connecting face-to-face or online, spend time with people who value you, and whom you value. Connect outside your sphere — Educators spend an inordinate amount of time with educators. Join a club, group, craft, sport, and connect with people outside of education. Re-joining a tennis club after a ‘considerable’ absence has been incredibly beneficial for me physically, mentally, and emotionally. Reconnecting with friends from the past is a real ‘blast’. Biophilia — the love of life and living things. All of us have an innate need to connect with nature. Biophilia is increasingly considered with building design to make the most of natural materials and building to allow us to view / connect with nature. I am acutely aware of the feeling of connection in my office with my treetop view. Even without going outside, I feel connected and this brings a certain feeling of tranquility, even on a stormy day. Be neotenous (retain child-like attributes into adulthood)! Blow bubbles, play in the leaves, laugh, and have fun! So, as you begin to wrap around the layers to protect you from the harsh reality of the winter season, wrap around a thick layer of goodness and kindness to yourself. YOU MATTER! Say NO more often to the things that stress you, wear you down. Say YES more often to the things you love, time with family, friends, fun and laughter. And maybe, just maybe, develop a healthy dose of JOMO — joy of missing out! There is almost always joy to be found in missing out on something, there is almost always a silver lining to that cloud! How do you ensure that you matter? Thanks James for taking time to read my post and comment. Like you I think the timing of this post is great. As we enter term two and winter starts to bite, it is even more crucial to really care for ourselves. I can't wait to see ideas shared here for how to continue to ensure we make time to fill our own cup, to take good care of ourselves. I wonder if you have one way of really making time for you that you would be prepared to share? Thank you, Anne! I agree with James – one week in and the teachers I work with are also feeling like the break is a distant memory. This is especially so for those that did not take a huge break over the non-contact time to revive. I have also shared it with my student daughter and ecouraged her to share further. The pressure on them at the moment is huge with their assignments piling up as well as exams looming. A little emotional hygiene may just be what they require to make a difference to their stress levels. 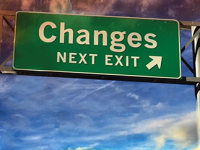 I have already had discussions with you about this and have begun to make changes that are making a difference for me. One app that I love is called 'Calm' – it provides you with mindfulness meditations of varying lengths that can be guided or unguided, with some as short as 2 mins. Great for those moments when you need to count a little higher than 10. I remember, very vividly, a lecturer at Teacher's College stressing to us that we had to find a way of unwinding each day or week, rather than waiting for holidays to get off the treadmill of teaching. This has stuck with me and stood me in good stead, to make sure each week I have some rest and relaxation. Thanks for sharing with your daughter. Students are in great danger of succumbing to the stresses and pressures without 'emotional hygiene'. I would love to hear some of the ways your daughter and colleagues have on ensuring they stay as well as possible. Thanks so much for sharing "Calm' app. I would love to hear of successes people have with this. I am thoroughly enjoying the reminders from my fitbit to get my 250 steps every hour. I am taking this as a chance to indulge in a short walk outside, or in the garden, or near trees if possible. Anne! Thanks for reminding us what matters and providing practical ways to take care of ourselves. You are MAGIC! In a human-shaped profession such as teaching it is very easy to feel at the end of the day that you have not done enough, helped enough, been enough. I recently 'found' Brené Brown who reminds us to consider 'No matter what gets done, and what gets left undone, I am enough." Brené is a researcher who studies human connection — our ability to empathize, belong, love. Grab a cuppa and watch her poignant, funny talk, TedX talk. This post is particularly relevant for me living in Christchurch. Post earthquake, even five years on, high levels of anxiety still exist. Many teachers are working hard not only finding their own equilibrium but also supporting students and their whānau to actively manage anxiety and wellbeing. The Mental Health foundation, using up-to-date evidence and research, found that building five actions into our day to day lives is important for the wellbeing of individuals, families, communities and organisations. They provide useful tools to help Christchurch and others rise strong each day! And write a mental note to self "I am enough"
Love your work – and play, Anne. Thanks so much for your wonderful response. I love the way you have reminded us 'we are enough'. 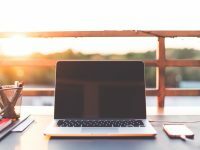 I remember the countless hours I would spend desperately trying to get 'everything done', ready for my learners, and the countless hours I would spend frustrated that there was always so much more to do. Realising 'I matter', and 'I am enough' is a journey. The more time I spend acknowledging that I am enough, I have done enough, the better I feel. Thank you so much for sharing the five actions to fit in our day! The world will be a better place for us all as we embrace these five actions. Today, my sister shared a link on facebook that I believe is worth adding to this post. 5 Things To Do Before You Die – Robin Sharma I love number five… Help as many people as possible! As simple as being generous with a smile to someone in need. Thanks for sharing Anne – some great ideas here. At the end of the holidays I was really struggling with the thought of getting back in to it. I was sick of always being busy, always having work to do and always feeling guilty about how much or little time I am giving my family. As it turns out getting back into it wasn't as bad as I imagined.I have also started admitting to others that everything feels 'hard' from time to time and to my surprise no one thinks less of me, my boss isn't upset and I feel better! It certainly helps to realise this is a problem faced by many teachers. Thanks so much for taking the time to read and comment. I wonder how many educators experienced exactly what you describe, the struggle of getting back into it. I think it will be all too common. Thank you for your very honest sharing of the steps you have taken. Admitting to others when times are tough is such a sign and strength, rather than what can be perceived as weakness. How wonderful to hear the responses you are experiencing. I wonder how many schools are encouraging staff and learners to share challenges, and celebrate 'failures'. Unpacking a challenge or 'failure' with a supportive team can be incredibly valuable. Sharing our vulnerability takes courage and I thank you for sharing this. What could we do to encourage more educators to admit to challenges, and ask for support? Thanks again for sharing. I thoroughly enjoyed working with you today too! Thanks Vicki for the idea of using Calm…I've just downloaded it and lay on the floor in my lounge to have a wee moment! It's so easy to forget ourselves in our busy lives as teachers and forget that taking time-out benefits the children we teach in the long run. I am particularly bad at doing this…or not doing this as the case may be!! 1) Read for pleasure again (no time limit given)! 2) Exercise again (maybe not a fiercely as I used to but just do something each day…perhaps get out a skipping rope and skip with the kids at school when I'm on duty…just so it's fun). 3) Go to bed earlier – 10.30pm at the absolute latest (I better get to bed)! !